One of the things I love most about having preschoolers is their artwork. The other day my children came home from preschool with some amazing artwork. Cadence, my 3-year-old daughter, held up a picture of all of her Barbies that she had painted. It was orange and red and yellow and very abstract. Not wanting to be left out of all this positive attention, Deacon, my 2-year-old son, rushed over to share his masterpiece as well. “Mommy! Mook at me,” Deacon exclaimed as he held up his picture. I looked at the picture and saw them, the thumbprints used for the body and wings of the bluebird. 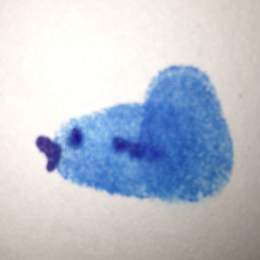 Blue ink, a tiny thumb, and a seized opportunity for art—a masterpiece indeed. It strikes me that nobody else could have made that exact bluebird. That bluebird was made with his thumbprint. He had to get in there and get his hands dirty to make his unique mark, to create the artwork that impacted me so deeply this week. And you know what else? He was so proud of it. He was not cautious that his artwork would not be good enough, nor did he consider what others would think. He saw an opportunity to get his hands dirty and create and he did it. If only I would seize every opportunity to participate in the work of God’s masterpiece. What would happen if we each took the opportunity to use what we already have inside ourselves for good? I wonder how my life would be different if I had enough confidence to make my mark, the one that only I can make, and then hold it up for the world to see. There are so many ministries and social justice projects out there in the world. There are opportunities with people at work or in your neighborhood. I know that there are times in my own home that I am needed to step up and speak the truth of God’s love over my family-to make my mark. Are you willing to get your hands dirty to further the Kingdom of God?